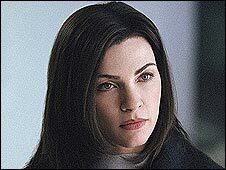 Actress Julianna Margulies has revealed she turned down the chance to appear in the final season of hospital drama ER. Margulies played nurse Carol Hathaway from 1994 to 2000. Her character left the show to settle down with George Clooney's character, Dr Doug Ross. "I feel like I left Carol in the best scenario possible," said the 42-year-old. "I can't imagine making it any better than that." Ex-stars Anthony Edwards, Noah Wyle and Eriq La Salle have agreed to return. The show's producers have also said they hope to bring Clooney back for a guest appearance. Margulies left ER eight years ago despite being reportedly offered $27m (£18m) to remain with the show. Since her departure, the actress has appeared in The Sopranos, BBC mini-series The Grid and the 2006 film Snakes on a Plane. Set in the emergency room of the fictional Chicago-based County General Hospital, ER was the top-rated drama on US television for several years. The series - created by the late author Michael Crichton - will end with a two-hour finale in May 2009, preceded by a one-hour retrospective.